Firebase is a Backend-as-a-Service BaaS own by Google. It frees both mobile and web application developers from writing APIs, managing servers, and worrying about data store. Just focus on your application and Firebase will do the rest for you. 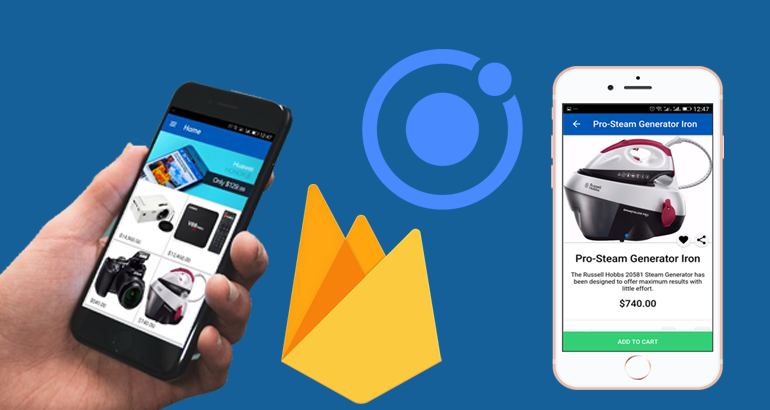 In this article I will walk you through building an ionic 3 shopping cart app leveraging on Firebase Real Time Database. The first thing is to setup the firebase project for the app. Head on over to firebase console and click "Add new project". Give the project a name, i have named my own "ionic-firebase-cart" then click "Create Project Button"
You will now be presented with the screen below. Click on "Add Firebase to your web app" and copy the snippet provided into a text file as we will be using it in our ionic app shortly. Good, we are set and our Ionic App is now know how to talk to our firebase project. I have setup some dummy products images and also have created a json database for this tutorial. For you to follow along, download the files from here. The "ionic-firebase-cart.jon" is the firebase database that we will be using. Login to your firebase account and select database, in the top right click "Import JSON"
In the modal that will be presented, browse and choose the file and click "Import". Now that you have done all these, in the second part of this article we will dive int coding our shopping cart application.